The new Carrera 40 is not just another Yasuni exhaust, it is the exhaust with the best power output on the market and is designed specifically for scooters with 100cc cylinders. 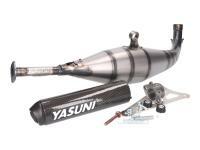 Yasuni developed this exhaust especially for high speed racing such as Drag Race and limited the production to just 25 handmade copies. In addition, the exhaust has a shorter performance carbon silencers. All parts required for installation are included.